The built-in battery lasts up to 300 hours in a standby mode and it takes about an hour to charge the device with the included USB cable. The selfie stick comes with a travel pouch. Compatible with Android 4.3 or newer. Doesn't work with earlier versions. 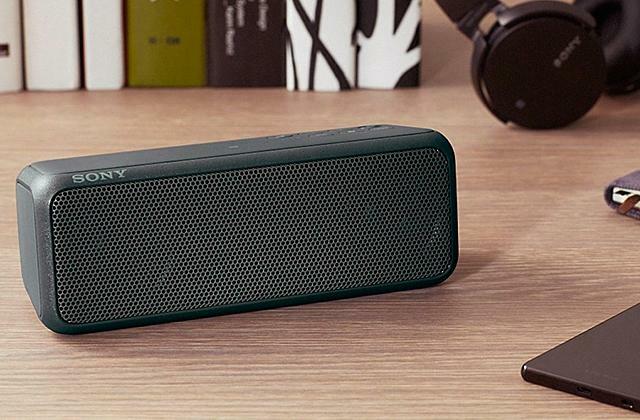 The perfect and versatile accessory for any gadget you've got. 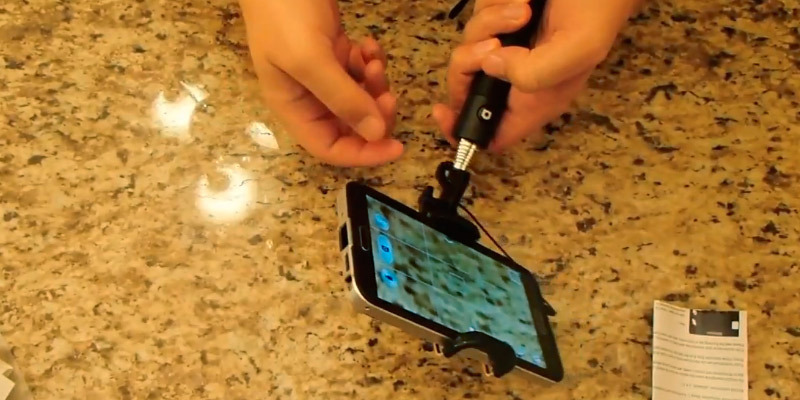 Owing to 3 included mounts, you can attach your phone, action camera and even reflex cameras to the monopod. 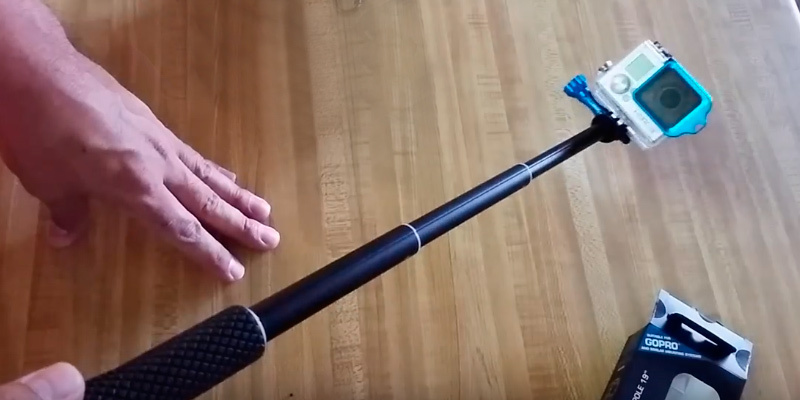 You can mount a gadget of any size and weight on this selfie stick. 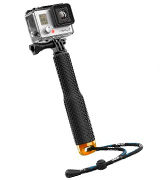 The pole made of anodized aluminum is scratch-resistant and the monopod can be easily folded or extended. The remote is not included, thus you should buy it separately. This model is perfect for both everyday use and underwater video recording since it is made of durable rust-resistant material and doesn't have any cables or wireless connections. This selfie stick is one of the most compact accessories when folded. 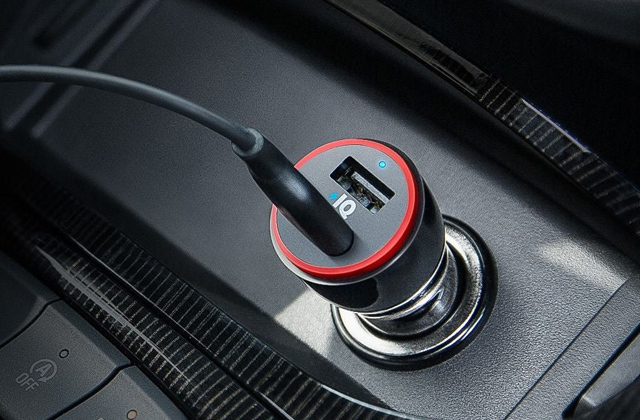 Doesn't require any sophisticated settings and is known to be quite convenient as far as a gadget mounting is concerned. Bluetooth is automatically disconnected after several minutes of idling. 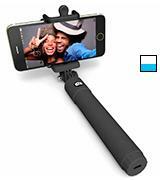 This affordable Bluetooth selfie stick will suit perfectly any smartphone not wider than 3.14-inches, and allows adjusting a phone mount at any angle. Adjustable mounting bracket with rubber clamps for smartphones from 2.16" to 3.34"
The handle cap with USB port is made of metal, which makes it more durable and reliable. 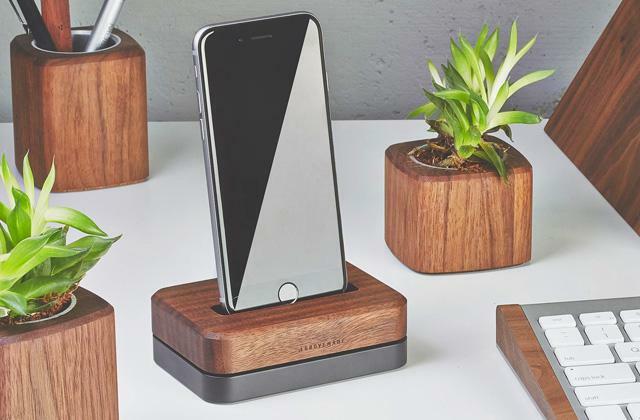 And the silicone clamps will hold your smartphone gently yet securely. You will have to hold the button for 2-3 seconds to take a photo. It is a lightweight, compact, and convenient selfie-stick that will be a real find for any user. With its 270-degree rotating head, you will easily find the proper position for the best shots. Adjustable mounting bracket with silicone clamps for smartphones from 2.2" to 3.3"
The whole construction and the telescopic rod shows great durability and long service life. The rubberized grip handle won't slip out of your hand due to excellent frictional force. Available in 3 colors. The pole is rather short when extended. 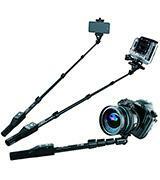 Probably, one of the most convenient monopods for use with action cameras. It provides secure and firm fixation even in case of quick movements and feels perfectly in your hand while video recording. Fugetek FT-568 Professional Selfie Stick is compatible with a number of gadgets: Android and Apple smartphones, digital cameras, GoPro, and even DSLR cameras (not too heavy ones, though). The mounting of all the above-mentioned gadgets is performed with 3 included removable mounting brackets designed for different devices. Therefore, the selfie stick comes with 2 adjustable phone mounts, one with the lock extendable to 4.2 inches and the other one for the phones up to 3.2 inches. The latter clamp is designed with a mirror for rear cameras use, hence you will be able to see what you are trying to capture and get a great pic at a high resolution. Additionally, the Bluetooth selfie stick comes fitted with a screw tight mount for different types of cameras. In comparison to the competitor's monopods, Fugetek FT-568 Professional Selfie Stick is the most versatile model since it offers you a capability of taking a photo on literally any gadget you have. We'd also mention that this monopod has an extendable pole for up to 49 inches long, therefore this model is great for taking pics from high angles. One of the main features that distinguish Fugetek FT-568 from other selfie sticks is that it is equipped with a detachable remote control that can be used on the selfie stick or separately. This device is Bluetooth-enabled and has 3 control buttons: shutter release and zoom in/out buttons (zoom feature on the remote doesn't work with iOS, thus all the 3 buttons work as a shutter). All in all, this remote is compatible with all Apple and Android 4.3 or newer operating systems, plus you can connect it with GoPro and DLSR cameras via Bluetooth! What is important, the remote offers quite a long autonomous work; it lasts up to 300 hours in a standby mode and it takes about an hour to charge with any standard USB cable. Just imagine the variety of photos you can take using this selfie stick. Owing to the remote control, you will always be in the picture of a group shots even if you want to use a tripod. 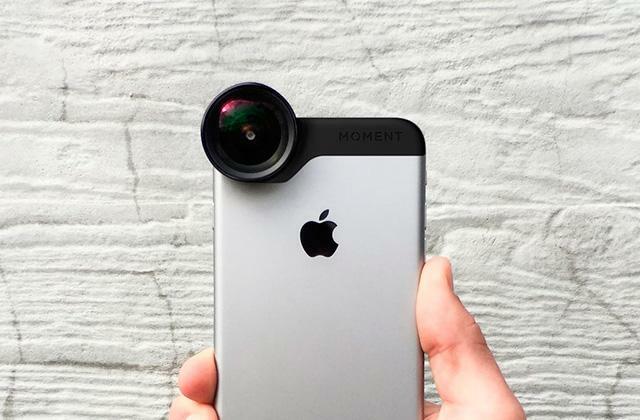 If you don't know which lens to choose for your phone, look through our review on iPhone camera lenses. 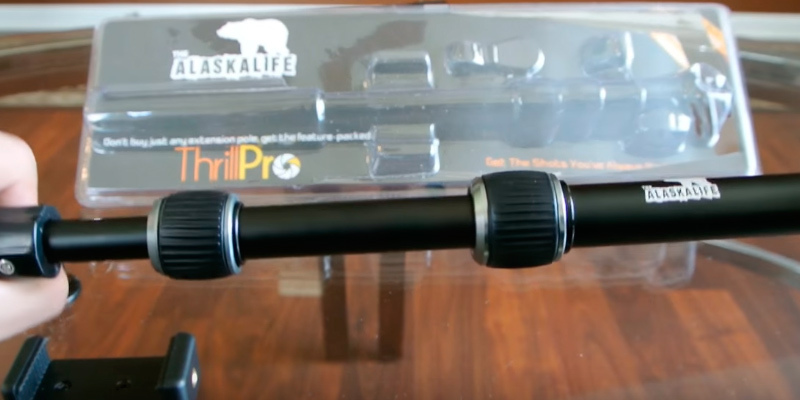 The Alaska Life monopod selfie stick has proven itself as one of the most durable sticks in its class. As it turned out, such high strength is achieved owing to the pole's telescopic design, threaded connections and the mounting screws themselves. 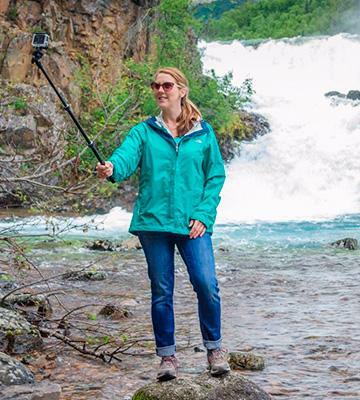 The aluminum pole guarantees the lightweight and high-quality of the selfie stick. 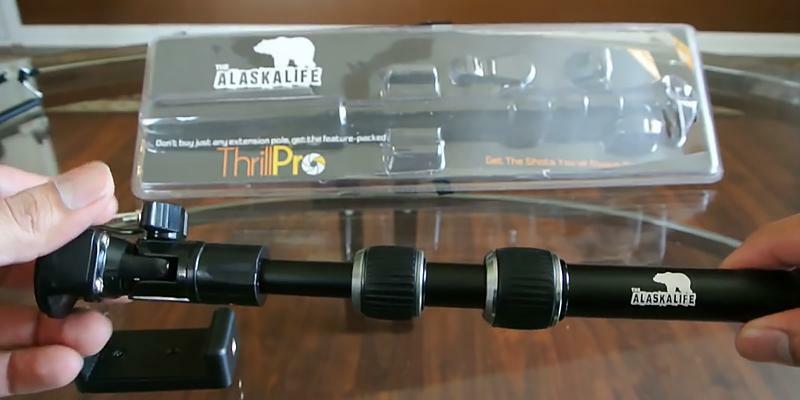 Moreover, The Alaska Life monopod is water- and rust-resistant, thus it is perfect for underwater use. We are sure that divers will highly appreciate this feature! What we also like about this model is that the pole doesn't bend under a strain of heavy gadgets such as iPhone 6 plus and even DLSR cameras. Thus, you can fearlessly mount the most expensive reflex camera on a stick and be sure that it is secured. For contrast, 80% of monopods available on the market cannot boast such solid and secure construction. The selfie stick doesn't feature Bluetooth or cable connection, so we'd recommend you to opt for a remote or use your smartphone's built-in self-timer. It may be interesting for our readers to know that the longest selfie stick ever belongs to Ben Stiller. He broke the world record for the longest monopod at the London premiere of Zoolander 2. The length of a pole measures 8.56 meters! Stiller managed to take a picture of the gathered crowd of photo poser and was presented a certificate by a representative of the Guinness Book of World Records. 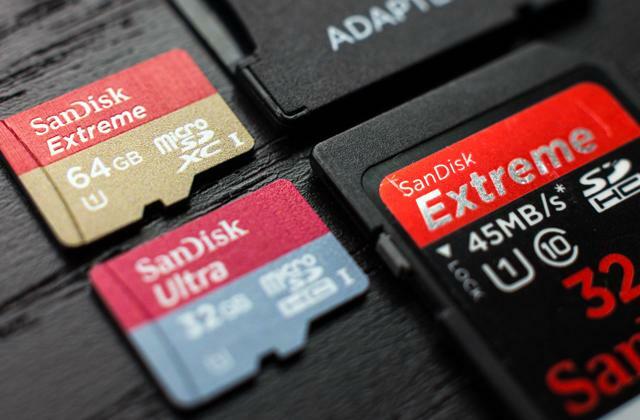 Not enough memory on your phone or camera? 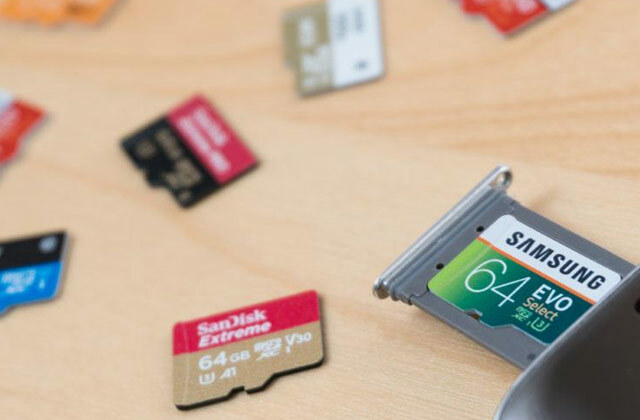 Opt for a capacious SD card and don't waste any moment of your journeys. 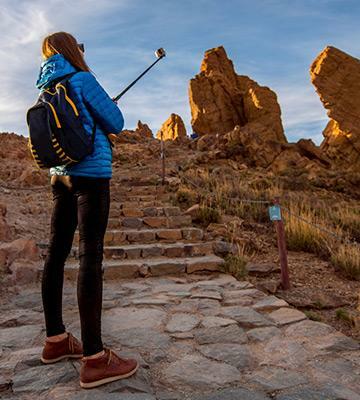 Perfectday monopod is designed for using with smartphones only. 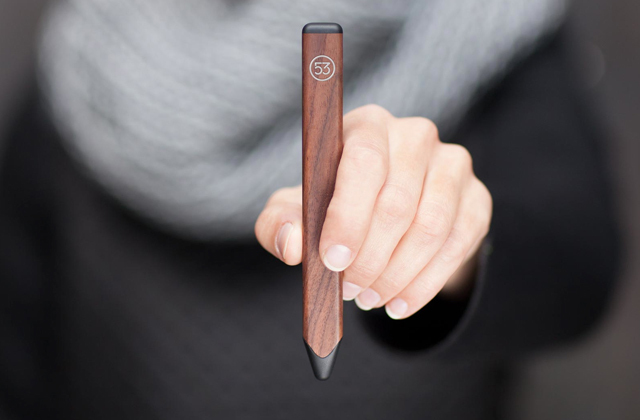 Regardless the phone's brand or operating system the stick is compatible with all the smartphones, which makes this model quite a versatile photography accessory. 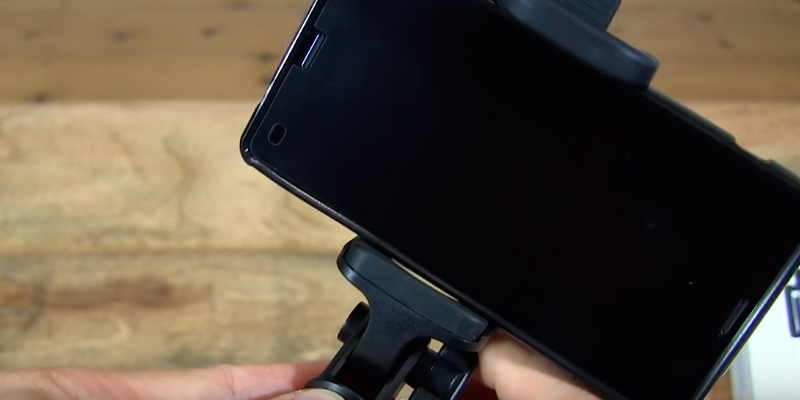 The mounting of a smartphone is performed with the adjustable mounting bracket with rubber clamps. Such construction ensures phone's safety and protects it from an accidental drop. The bracket clamps can be adjusted from 2.16 to 3.34 inches and it means that almost all modern smartphones will fit it. 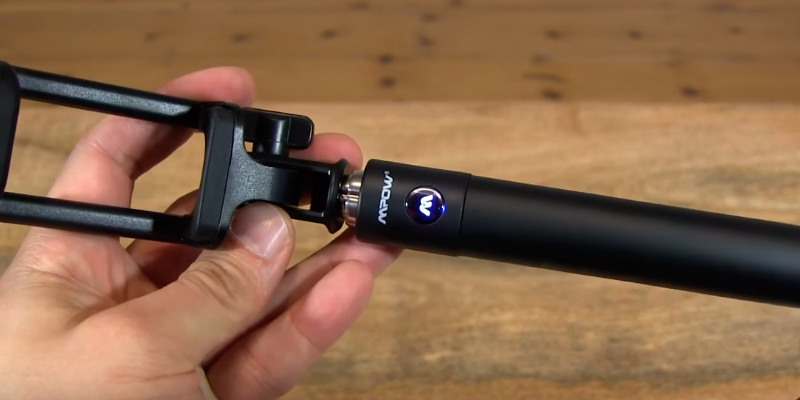 Another outstanding thing about this monopod is a 270-degree adjustable head and the mount that can be fixed at any point in a 180-degree position. Thus, you can position your phone in accordance with your needs to make the best shot. As for pairing the selfie stick with your phone, even a child can handle it! Just turn on the Bluetooth both on your phone and the monopod and choose your selfie stick in the list of visible devices. That's all, you are ready to make selfie! According to the research conducted by American scientists from the Florida International University, an excessive focus on making selfies may affect your personal life badly. Having examined the true-life stories of 420 volunteers, they came to the conclusion that the more selfies people posted, the higher the risk of provoking a conflict in the real life was. Making selfie is a kind of self-definition since people like the idea of being sort of in control of their image and attracting attention, being noticed, being a part of the culture. On the other hand, selfies are usually made by people who are fully satisfied with their appearance and life. So, some scientists find selfies as a negative development, while others believe that making selfie helps people track their personal development. Therefore, consider what selfie means for you personally. Nothing irritates more than a cell phone or Bluetooth selfie stick that runs out of charge when you least expect it. 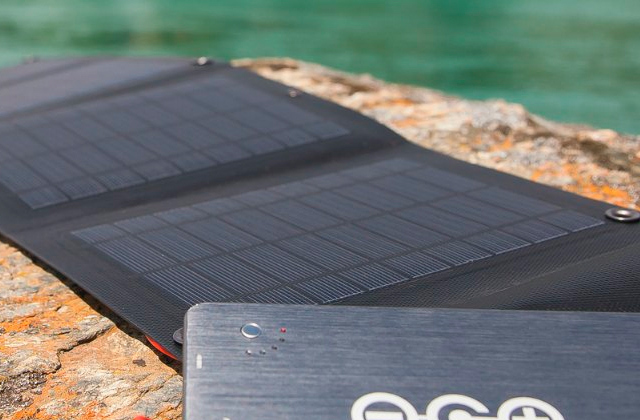 Consider a power bank that you can keep in your bag and recharge a lot of your gadgets quickly and anywhere. 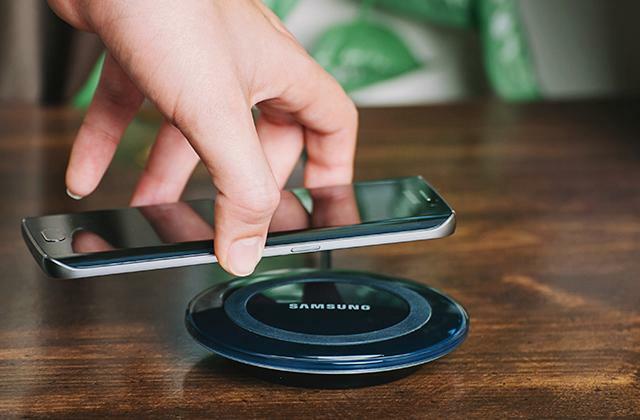 The Mpow company produces really top-brand smartphone accessories for a reasonable price. 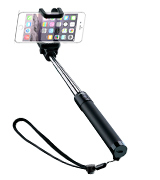 And this stylish and, at the same time, durable selfie stick is not an exception. The manufacturer did everything so that you could feel nothing but comfort while taking photos. The stick is light in weight and pretty compact. Its storing length is only 7.1 inches—perfect to put in your pocket; at the same time, an unfolded model reaches up to 31.9 inches allowing you to catch as wide picture as possible. In order to provide the best angle for shooting, the designers made the head able to be rotated 270 degrees. 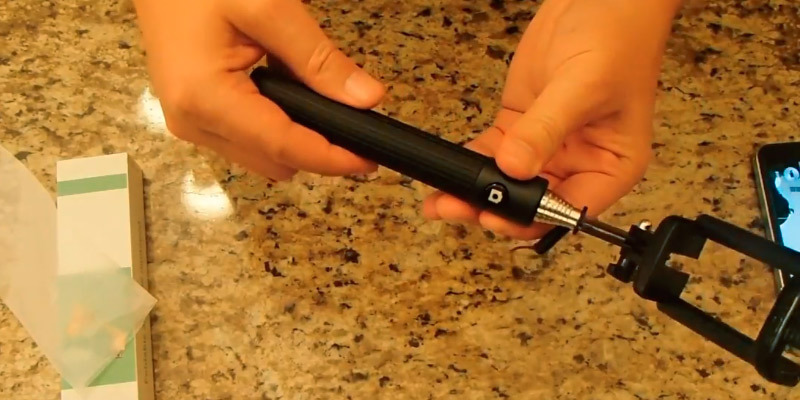 The Mpow portable selfie stick boasts a great battery. It is an obvious plus as we often make selfies on trips, hikes, etc. and there is no electricity at hand. The built-in Bluetooth remote control helps you achieve good photo sight and take pictures with ease, accordingly. 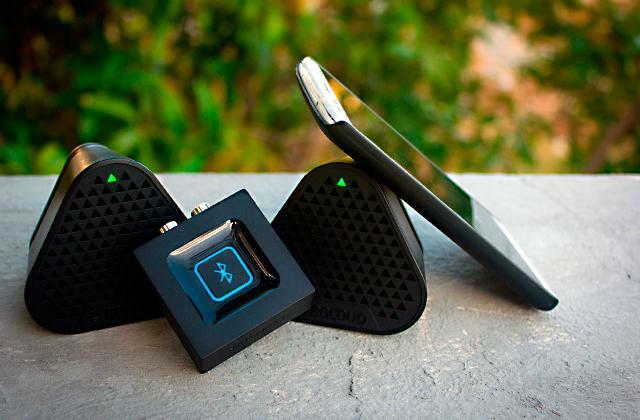 All you need is to turn your appliance on and pair it with your mobile device via Bluetooth. Now you are ready to capture your adventures! With such photography accessory, you can take pictures not only of yourself, right? To look irresistible and capture wonderful views behind you or make group photos, you should find an ideal perspective. Experiment with positions. For example, it is said that if you turn your face at 30-45° to the side, the picture will look more voluminous, and the chin line will be clearly visible. Since some colors are lost in a semi-dark room and with too bright light from a lamp, it is better to take pictures in natural light. And try to keep the light source in front of you, above the eye line. Simply photographing yourself is a common thing nowadays, no one will be surprised. If you would like to impress your friends, you could shoot a cool video. Met a famous person (an actor, artist, or a musician)? It is a great chance to make an unforgettable video or selfie. You might have known that already, but if you haven't, here is a lifehack for selfie-lovers: the main camera, as a rule, has better characteristics and makes better quality pictures. Although there is nothing difficult to handling a selfie stick, read the instructions carefully and watch video reviews to improve your skills and achieve the best result. It will help you understand how to use your particular model of a selfie stick. A smile is one of the most pleasant facial expressions. It makes people much prettier and friendlier. Do not forget to smile! Keep these tips in mind and surprise your followers on Instagram every day! Those who appreciate memories and would like to save them could purchase a digital photo frame. This ultra modern accessory will store a bunch of your pictures and allow you to view the photos in excellent quality. 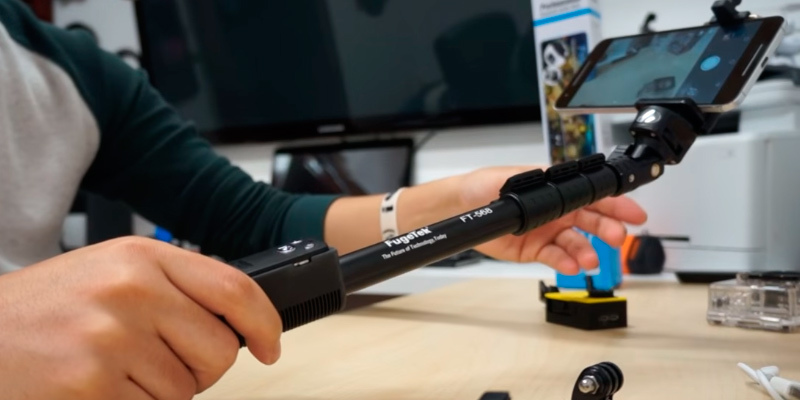 First of all, we'd like to mention that Lightdow X-POV monopod doesn't need any cable or wireless connection. Thus, you can cam everywhere, anytime, under any weather conditions, and even underwater. Despite its affordable price, the selfie stick is noted for high durability and such property is achieved owing to a telescopic rod made of aluminum oxide. This material ensures anticorrosion protection and thus prolongs the lifespan of the monopod. We are sure that thrill-seekers will really appreciate the Lightdow X-POV selfie stick as it's capable of recording your videos while skydiving, skiing, surfing, and snorkelling! Moreover, the rubberized grip handle fits comfortably in your hand and lets you carry it anywhere. An action camera is mounted on the monopod using the included screw tight that guarantees a secure and firm fixation even under the conditions of joggling and quick movements. Additionally, the selfie stick comes fitted with the adjustable wrist strap, thus you won't lose this great accessory in the most extreme moments. According to sorrowful selfie statistics, more people died in 2015 as the result of selfie accidents than by shark attacks. 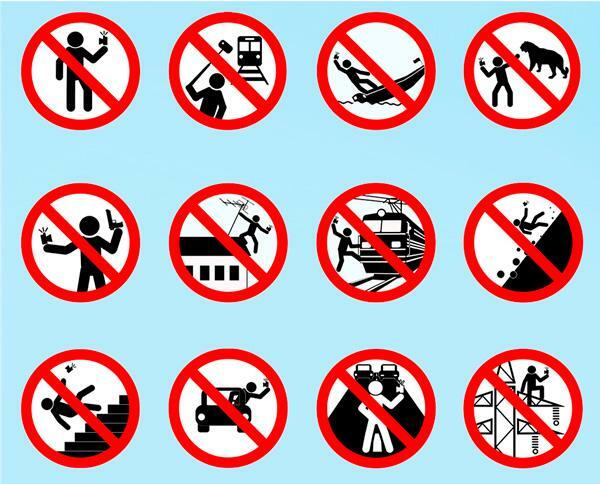 To be more precise, 12 people died while attempting to take a dangerous selfie and 8 have lost their lives as a result of shark attacks. 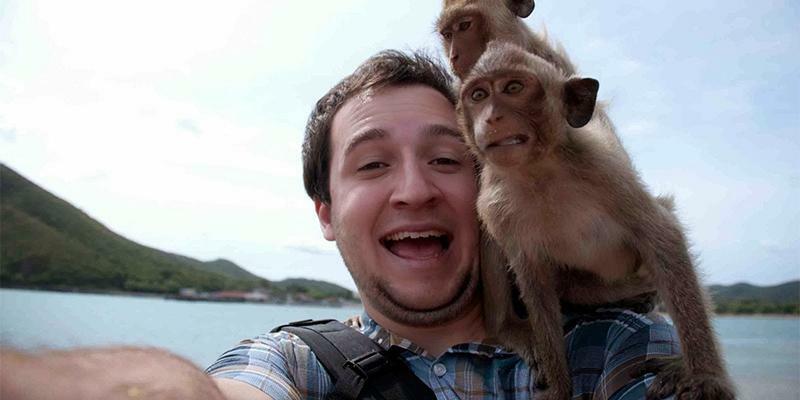 Therefore, several wildlife reserves and national parks in America prohibit taking selfies on their territory. As the witnesses say, people wanted to take a selfie with bears and bisons while others selfie shooters have fallen from cliffs! So, be careful and always be aware of your surrounding as there is no selfie that is worth your life. With L.Store ® Waterproof bobber you will never lose you action camera during water activities. Nowadays almost every person has got a smartphone with a built-in camera that is capable of taking a high-quality photo of a beautiful scenery or your family, friends etc. But the present-days photo trends acquaint us with selfie, welfie, twofie, threefie, ussie, relfie and other fancy photos. The crucial feature in making such pics is a monopod or so-called selfie stick. This item is actually a great photography accessory for travelers, photography fans, and everyone who wants to take the best shots of himself or herself. A selfie stick offers you an ability to position your gadget beyond the normal reach of the arm and, thus, make a perfect selfie or a group photo and capture all the background. Using a monopod, you can be sure that everyone fits in a photo since this accessory provides the framing flexibility. 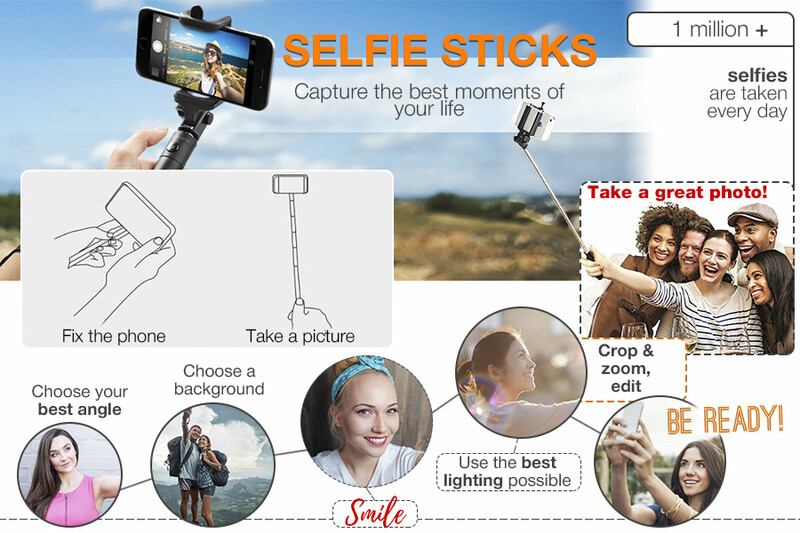 We do recommend you to opt for a selfie stick that will definitely help you capture the best moments of your life. 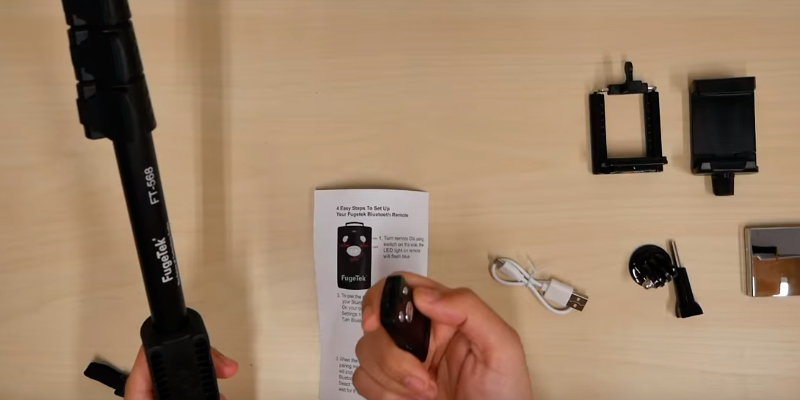 We'd also recommend you to look through our reviews of car phone holders, mobile printers, stylus pens, and iPhone camera lens which will definitely enhance the efficiency of your mobile devices. Today, most selfie sticks are compatible with literally all available operating systems (OS), but you should still read a monopod's manual carefully to be sure that your smartphone will work with the accessory you've chosen. There are selfie sticks that can be used with action cameras only, while other models are universal and are compatible with smartphones, action cameras, and even digital cameras. 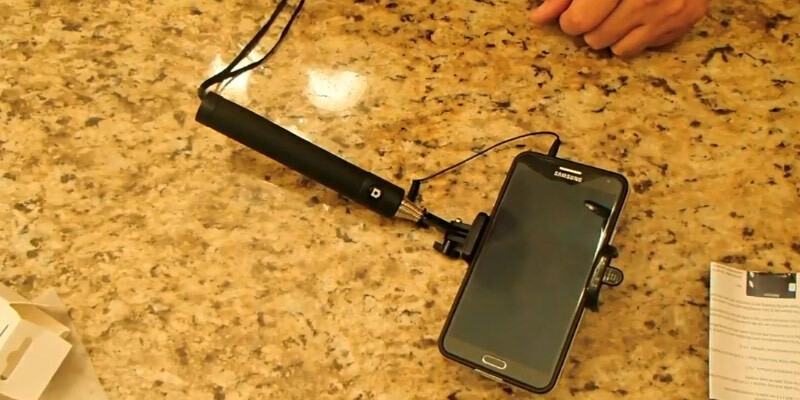 Regarding the mounting type, monopods come fitted with a mount with adjustable width to hold smartphones of any size. We recommend you to choose a pole with rubberized clamps or bracket that firmly squeezes your device around to ensure its safety during use. Just make sure that a clamp included is compatible with your gadget type, size, and weight. 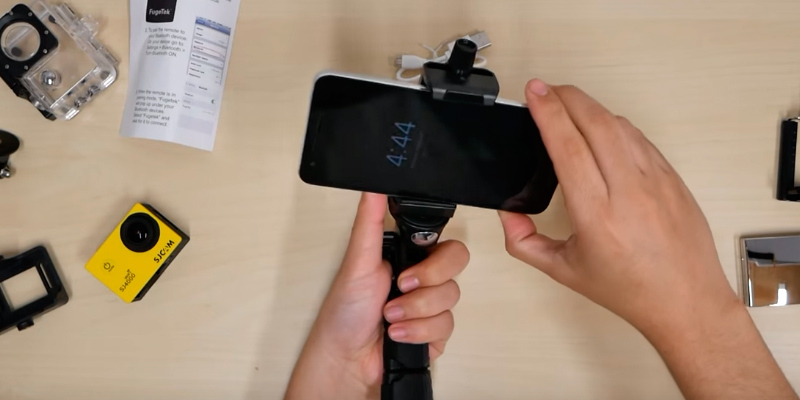 A clamp should be made of durable material to ensure the safety of the mounted phone, but if you are going to use your action camera with a stick, opt for a monopod that comes with a screw tight made of metallic materials. 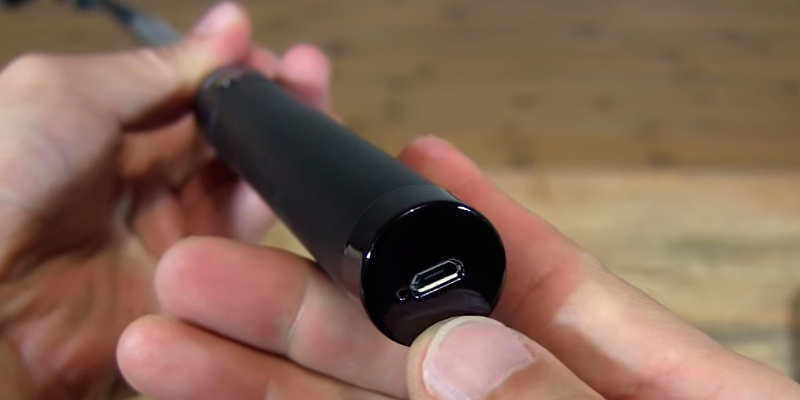 There are 2 main ways of connecting your device to a selfie stick: Bluetooth and a cable with a 3.5 mm jack. Bluetooth connection doesn't require any cables, you just need to pair your smartphone with a stick and take a photo or video. The only disadvantage of a Bluetooth selfie stick is that it requires charging. 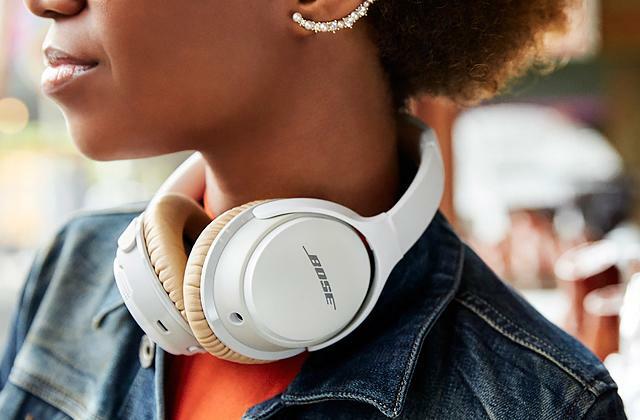 With a cable option, you have to plug a built-in cable into a headphones jack when your phone is mounted in place. Such connection is secured from a signal loss but none cable is immune to mechanical damage. You can also find models that don't require any connections. 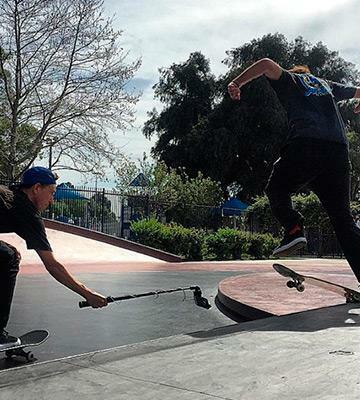 Generally, such selfie sticks are designed for use with action cameras. 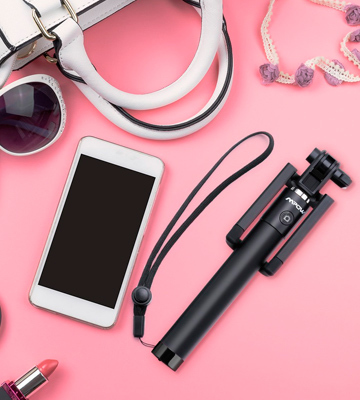 The next feature you should pay attention to is the material a selfie stick is made of as it affects the durability and service life of a monopod. 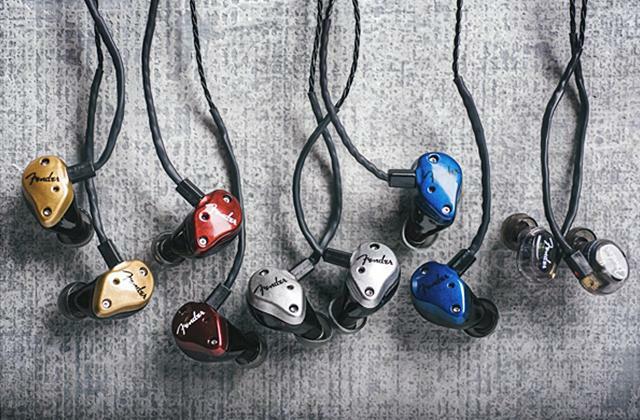 Basically, high-end models are made of aluminum or aluminum alloys, making a monopod lightweight and rust-resistant. While some chip poles are made of metallic alloys and you cannot be sure that a stick won't bend or crack. The material of a pole is a crucial feature as who knows in which weather conditions you will be making a selfie? The last thing you need to consider is the usability of a selfie stick since you should enjoy taking pictures. The vast majority of selfie sticks are designed with a camera button on it, thus you don't have to use a timer to take a photo. Other sophisticated models can be controlled remotely with the help of remotes. In addition, the remotes might have not only a shutter release button but also zoom buttons and controls to shift between photo/video or rear/front cameras. Additionally, a selfie stick should be portable, thus opt for a model that is quite compact when folded. You'd definitely want a model that can be extended far enough from your body to make the best shot. The length of the stick depends on your preferences only but we'd recommend choosing the one with many extending sections, hence you will have lots of adjustment variants. 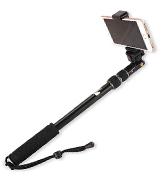 Choose a selfie stick with a rubberized handle since it ensures a firm grip and safety of your phone. 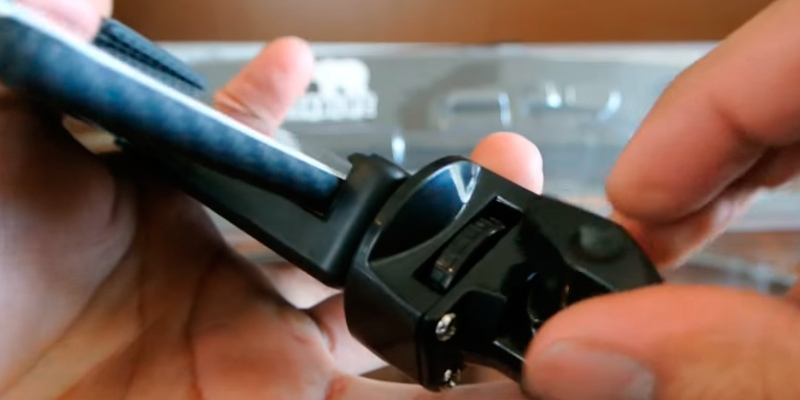 Some monopods offer a capability of adjusting the angle of your phone with a swing bracket or feature special pull off clips that prevent rotation of telescoped joints. All in all, consider all the benefits of each selfie stick and choose the one that suits you best. 1. Antonio Villas-Boas The Best Selfie Sticks, PCMag. April 21, 2015. 2. Adriana Lee How To Pick A Selfie Stick, Readwrite. January 12, 2015. 3. John R Harris Selfie Sticks: A B&H Buying Guide, B&H. 4. 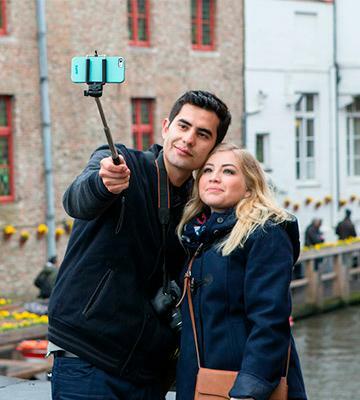 Elyse Betters A Buyer's Guide to Smartphone Selfie Sticks: Which One Should You Get and Why? Pocket-lint. May 25, 2015. 5. How to Take Good Selfies, wikiHow. 6. Selfie stick, Wikipedia. August 6, 2016. 7. Elisa Chavez How to Use a Selfie Stick, PicMonkey. November 9, 2015.